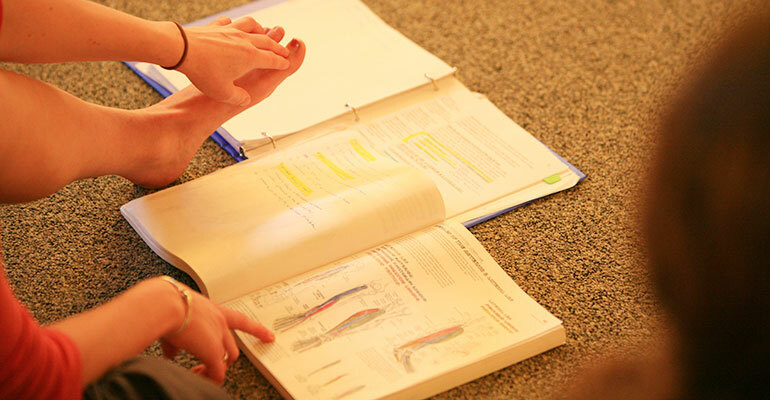 These college-level courses combine the study of anatomy and physiology with the study of pathology, creating a seamless survey of the science of the human body. While anatomy and physiology examine the structure and function of the human body, pathology examines the disruptions in homeostasis that may occur with disease. All topics are related in a clear and relevant manner to the practice of massage therapy. Students will come away with a thorough understanding of the workings of the human body, practical knowledge of commonly encountered health problems, and tactics for communicating and working with clients and other health professionals. Students will have a unique opportunity to visit Southern Oregon University’s Cadaver Lab as an adjunct to Kinesiology. There, they will view the musculature and other internal body structures of a human cadaver. The individual level of participation in this experience depends on each student’s interest. In this course, students will be introduced to the art of palpation (touch) through self-awareness, compassion, and receptivity. Swedish Massage is the foundational class for our Professional Massage Program. Primarily a hand-on class, Swedish Massage familiarizes students with the intimacies of this profession. Both pivotal qualities, sensitivity of touch (palpation) and personal presence are woven throughout the curriculum. We practice specific techniques and skills as well as boundaries around client/therapist interactions, creating a safe space for all involved. This class requires giving and receiving much massage for assignments, and it emphasizes the importance of feedback in learning the craft. Bringing massage into the community is most commonly done by transporting a massage chair to an out-call location. Working with clients on a chair requires the practitioner to use a different set of body mechanics, business tactics, and techniques. This class prepares students to take the show on the road and ends with a supervised volunteer chair massage experience (or two!) in the community. Past venues include the Pear Blossom Run, Ashland’s First Friday Art Walk, Student and Family Housing at SOU, Rogue Valley Medical Center, Providence Hospital, YMCA, and others. This is a valuable and fun learning experience. Pregnant women and their bodies require special attention during the formative months of a pregnancy. How to approach a pregnant body—and what to avoid—are taught in this hands-on class instructed by a pregnancy massage expert. Students will get to practice techniques with each other and watch a demonstration on a pregnant volunteer. Working with people in their later years is becoming more common as our population ages. The specific considerations for interacting with elders and providing safe and knowledgeable treatments are addressed in this initial course on elder care. The class includes an intimate Q&A session with a panel of seniors well-versed in massage, helping to bring awareness to the realities of aging and demystifying misconceptions about old age. Combining techniques from Neuromuscular Therapy and deep tissue methods, this course explores deep tissue release and injury rehabilitation as well as how to relieve chronic and acute pain. Many specific techniques are taught for a diversity of conditions such as such as thoracic outlet syndrome, carpal tunnel, whiplash, and sciatica. This course teaches how to palpate and release restrictions within the fascia (connective tissue) that envelops the muscles. Rather than focusing on specific muscles, MFR requires a shift in thinking to perceive the body in terms of interconnecting fascial planes. MFR calls for no oil and is very slow. The actual strokes are quite different from standard massage strokes, sinking into the tissue to grab and move fascia instead of working only muscle. This course teaches specific body mechanics that use low tables and allow contact and manipulation of the fascia with little strain on the therapist. This course builds on and makes use of all the skills and knowledge a student has learned thus far in the curriculum. Students will hone their palpation skills while learning how to identify postural or repetitive stress patterns and specific musculoskeletal conditions. They will learn to use orthopedic assessment skills and develop treatment plans employing a combination of new and previously learned techniques toward the goals of reducing pain and improving function. Career skills such as client interviews and medical charting will also be practiced and enhanced, and students will gain a thorough understanding of when and how to treat specific complaints and when to refer to another practitioner. The course will include the opportunity for each student to conduct case studies with specific clients while receiving individualized input from the instructor on treatment planning and techniques. Thai massage is a 2,500-year-old practice performed on the floor with clothes on. Methods include stretching, compression, rhythm, and joint mobilization. Students will learn a one-hour routine, parts of which can be translated to the massage table and integrated into a traditional Swedish massage. This course is both fun and reverent. In this hands-on class, students will delve into the world of the athlete and learn what therapists can do to properly support them. Starting with a review of relevant anatomy and kinesiology, this class focuses primarily on the lower body. Students will gain a strong understanding of athletic injury treatment and how to help clients achieve their goals and excel in performance. Students will be introduced to foundational concepts of Eastern theory and will explore topics such as Five Elements, yin/yang, and meridian theory. Using water in hot and cold applications for health benefits is an ancient practice. This course provides a brief history of this tradition as well as fun, hands-on explorations of effective and easy-to-use treatments. These clinical experiences provide students with the opportunity to integrate their knowledge and skills in real-life settings. The Clinical Experience provides students with an opportunity to practice complete massage sessions in a supportive, supervised setting. This facilitates the integration of skills and helps to develop your professionalism and confidence while working with the public. Eight hours of the clinic involves working with healthy, active elders aged fifty-five and over; clients in the remaining thirty-two hours of clinics range from five to ninety-four years of age. In this class, students are introduced to one another, the school environment, and massage equipment as well as the field of massage therapy. Managing relationships with one’s self and clientele is the essence of the intimate profession that is massage therapy. In this class, we explore boundaries, values, personal awareness, and how our individual histories influence our views, behaviors, and choices. Special classes on non-violent communication foster healthy verbal skills and self-awareness. The course gives students a chance to consider what kind of massage practice they want and how to build it. We cover essential business development skills such as vision, marketing, business/life plans, HIPPA, insurance billing, taxes, bookkeeping, and the Oregon Laws regulating the practice of massage. This culminating course provides a review of kinesiology, massage, pathology assessment and communication skills. Students refresh the information necessary to be at the top of their skill set upon graduation. An overview of the highlights of our core curriculum, this course concludes with AIM’s final exam.